Stitched this sampler for my nephew’s wedding in March. 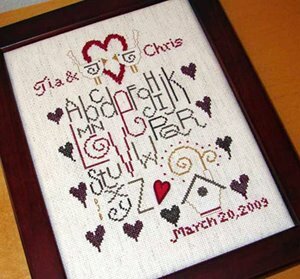 I changed the pattern slightly by adding seed beads for the heart instead of using french knots, eliminating the border, and personalizing it, of course, for the happy couple. « Found my missing cross-stitch stand!